The introduction of C4FM / FDMA technology is the beginning of a new digital communication system in Amateur Radio world. The most attractive advantage of digital communication is the ability to transfer large amounts of data. The 12.5 kHz channel spacing in using the C4FM FDMA digital modulation mode allows high-speed data communication with reliable voice communication and strong error correction performance. C4FM FDMA offers a 9.6 kbps data transfer rate speed. It differs significantly from existing digital radio systems and expands the possibilities for interesting amateur radio activities in the future. V / D-mode voice and data communication in the same time frame. This mode allows voice data with GPS position data and the ID data to be sent in the same time frame. In addition, transmitting the voice data with strong error correction data, this mode that contributes to the stabilization of the digital communication. This mode is the basic mode of C4FM FDMA Digital HAM radio system. Data FR mode uses the full data rate of capacity for the Transmission of data. This mode allows you to transfer large amounts of data, text messages, pictures and voice notes data at twice the speed as the V / D-mode. Voice-FR mode uses the full data rate of capacity for voice data. This mode allows a clear high quality voice data transmission. VHF / UHF amateur radio operators . These four modes automatically upon receipt of the respective signal. Utilizing the digital communication, the WIRES-X operation is simple, easy and user friendly. Varieties of the new functions as well as voice communications expands opportunities for enjoyment of ham station operation. WIRES-X automatically connects to nodes and rooms via the Internet. No more need to verify connection IDs or transmit cumbersome DTMF connection codes. Information about nodes and rooms is exchanged via C4FM Digital signaling. Thanks to automatic reconnection to the previous contact, all you need to do is press PTT and start talking.Easily search for new nodes and rooms, and initiate communication promptly when you find an ID that captures your interest. Currently active nodes and rooms can be searched in real time, and viewed on the display of your transceiver. The display list is sorted according to the number of stations currently connected to the room, in other words by popularity. This lets you quickly find other active stations to communicate with. Node owners can freely create a room ID using letters and numbers. The ID works a bit like the name of a person. Easy to understand, meaningful names, unique names, memorable names… all are possible and can be used in a targeted search. A history of previous nodes and rooms, and a memory function with five categories makes it a snap to find and connect with a particular ID. News bulletins (messages, images, voice memos) can be freely uploaded to nodes and rooms. Other users can download the saved news information. For example, sharing traffic information or other local news, or sending a snapshot of a meeting place to fellow operators, as well as a myriad of other uses are possible. It does not matter whether someone is nearby or in a country far away. WIRES-X offers a way to overcome barriers of distance, time, or even language. Welcome to a world of previously unheard-of possibilities for connecting and communicating by way of Amateur Radio and the internet. Search and connect to local node stations with a simple button touch. The system will automatically obtain node station information and setup the required frequency and digital code parameters. Wherever there is a WIRES-X local node station that is reachable by Amateur radio, complicated connection operation steps are no longer necessary. Node station ID, city name, as well as distance and bearing are indicated on the display of the transceiver, and can be checked at a glance. Now you can communicate worldwide with ease and confidence. WIRES-X of course also supports traditional analog FM users. 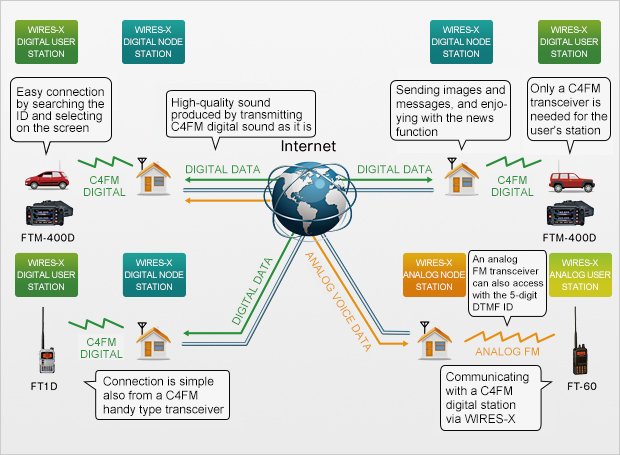 Not only can analog FM stations have a QSO with each other, WIRES-X also permits C4FM Digital stations to communicate with analog FM stations. WIRES-X is an FM friendly digital solution, because Amateur Radio should always allow operators to communicate freely all over the globe. ON0DP System Fusion VHF repeater is now in full digital mode. Wires X-connection is possible. The repeater are connected , for test, in Wires-X room 27035 (Belgium North).